The Recover Arrow Detector is designed specifically to help archers and bowhunters recover lost arrows hidden under grass, leaves and other debris. With the camouflage pattern on most arrows, it is almost impossible to locate lost arrows. Let Recover do the job and save you time and money! 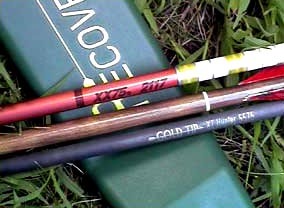 Recover is very effective in locating A/C/C or aluminum arrows, as well as outserts, field tips and broadheads of carbon or wooden arrows. This hand-held metal detector is compact in size, weighs only 6 ounces and can be easily carried in a pocket, fanny, or day pack while in the field. Recover operates on a low-frequency range and is completely safe with heart pacemakers and other such devices. Buy a Recover once, and we guarantee you'll save time and money for many years. Recover has a unique feature that provides you with a handle to scan with. This makes it easier to scan, you won't have to crouch or kneel down to look for your arrows . Remove an arrow from your quiver, carefully remove the broadhead or field tip, and screw the arrow onto the Arrow Attachment bolt on the unit. 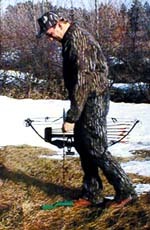 Makes it easy to carry for the 3D Shooter or Bowhunter. Protect your Recover unit and keep it handy. This Cordura carrying case is complete with belt loop and velcro closure. Copyright © 2005 Recover Inc.